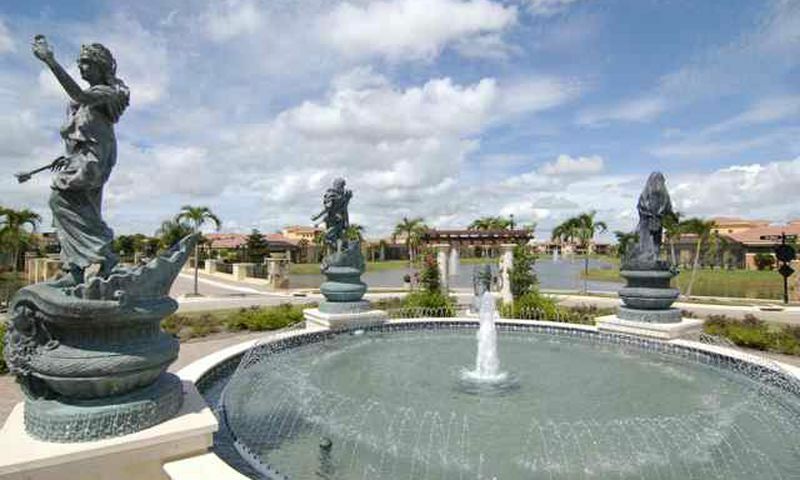 Rapallo at Coconut Point, located in Estero, is a lush Mediterranean-style community which is open to residents of all ages. Rapallo is situated in the North Village of the larger Coconut Point community, amid 22 acres of lakes and 23 acres of nature preserve. This spectacular 488-acre mixed-use community features 1,200 homes, over 160 shops and restaurants and its own healthcare complex. The many amenities at Rapallo include a fully equipped tennis center, state-of-the-art fitness center, members-only restaurant, botanical gardens, beautifully landscaped walking trails, and much more. Social clubs and community activities give residents many opportunities to get to know their neighbors. This spectacular resort-style community is located on Florida's Gulf Coast and enjoys the area's sunny weather and mild winters. Rapallo at Coconut Point offers resort-style living at its best. The Club at Rapallo offers a wide variety of amenities, including its own members-only restaurant. The Piazza Doria is the centerpiece of The Club at Rapallo. This trellised piazza is surrounded by lakes, bridges, fishing piers, and a lush botanical garden. Pedestrians will enjoy 2.5 miles of walking and biking trails, which connect the community amenities. A quarter-mile lakeside boardwalk also overlooks the Halfway Creek Wildlife Preserve. Residents can lounge in the sun while enjoying Rapallo's lagoon pools, or screen-enclosed Olympic lap pool. Rapallo's 13,200 square-foot Sports Club provides state-of-the-art fitness equipment, swimming, walking and fishing in seven stocked lakes. The men's and ladies' locker rooms are each fitted with showers, saunas, and massage therapy services. A full-time Fitness Director is available to support residents' fitness needs. For those who prefer a workout on the courts, the Tennis Center offers five lighted Har-Tru clay tournament courts. The center is complete with a stadium that seats over 240, a Player's Bistro with a catering kitchen, and a tennis pro shop. The 4,200 square-foot Arts and Learning Studio lets residents express their creativity. Three creative arts studios let residents focus on painting, sculpture or digital arts. There are also classrooms, a dance studio, and a media center with library and computer access. Rapallo residents can readily enjoy the adjacent Coconut Point Town Center, which features boutiques, familiar chain stores, restaurants, and other entertainment. Rapallo at Coconut Point offers 540 residences through four types of designs: Coach Homes, Carriages Homes, Terrace Homes, and Courtyard Villas. All homes are available as resale-only and in a variety of floor plans and sizes. Terrace Condos are located within three-story buildings, which have parking on the first level and home units on the second and third levels. Each unit is accessed by an outdoor terrace. There are three models of Terrace Condos available, ranging in size from 1,342 to 1,436 square feet. They have two or three bedrooms, two bathrooms, and a one-car garage. Coach Homes are first or second-floor units that include a one-car garage. They are available in five different floor plans that range in size from 1,606 to 1,836 square feet. These homes feature two to three bedrooms, two bathrooms, and a one-car garage. Courtyard Villas are attached homes that range from 1,824 to 2,376 square feet and feature two or three bedrooms, two to three bathrooms, and an attached two-car garage. Carriage Homes are also first or second-floor units, but they each include their own attached two-car garage. They also come in five floor plans, but are larger with sizes ranging from 1,966 to 2,584 square feet. These homes have two to three bedrooms and two bathrooms. Residents at Rapallo enjoy true resort-style living. The Club Manager, Activities Director, Fitness Director and other staff members are on hand to assure that residents' needs are met promptly. Some of the clubs and activities include yoga, poker, Tai Chi, tennis, bocce, social bridge, and book club. With Rapallo's many social clubs, amenities and community activities, there are plenty of events to fill any resident's social calendar. Located in Estero, along Florida's Gulf Coast, Rapallo is part of the larger Coconut Point community. The area enjoys a beautiful climate with daytime temperatures that range from 89 degrees in the summer to 60 degrees during the mild winter months. There are plenty of attractions in the surrounding areas, including some of the best beaches and parks in America. Rapallo residents can find both casual and upscale shopping and dining throughout Coconut Point, as well as within the community's surrounding areas. State-of-the-art medical facilities are close at hand, as are several great hotels, which are ready to welcome visiting friends and relatives. Rapallo at Coconut Point is a great community in southwest Florida. The Club at Rapallo is the heart of the communities where residents can participate in many activities. The Club at Rapallo - 10,600 Sq. Ft. The Sports Club has many amenities to suit the active lifestyle. Sports Club - 13,200 Sq. Ft. There are plenty of activities available in Rapallo at Coconut Point. Here is a sample of some of the clubs, activities and classes offered here. Terrace Condos are three-story buildings with elevator access and range from 1,342 to 1,436 square feet. These condo units have two bedrooms and two bathrooms. Parking is available on the ground level. Coach Homes are first or second floor units and are attached homes that range from 1,606 to 1,836 square feet. These attached homes feature two to three bedrooms, two bathrooms, and a one-car garage. Dens can be converted into additional bedrooms. Courtyard Villas are attached homes that range from 1,824 to 2,376 square feet. These villas are one or two story buildings and feature two to three bedrooms, two bathrooms, and two-car garages. Most units have a pool and all units feature lakefront views. Carriage Homes are attached homes that range from 1,966 to 2,584 square feet. These spacious homes feature big lanai space, two to three bedrooms, two bathrooms, and an attached two-car garage. Rapallo is one-of-a-kind! We are very pleased with our home here and love the unique look of the community. The fountains and lakes are beautiful, the tennis courts are great, pools always sparkling and clean, great restaurant and close to everything you could ever need! 55places.com is not affiliated with the developer(s) or homeowners association of Rapallo at Coconut Point. The information you submit is distributed to a 55places.com Partner Agent, who is a licensed real estate agent. The information regarding Rapallo at Coconut Point has not been verified or approved by the developer or homeowners association. Please verify all information prior to purchasing. 55places.com is not responsible for any errors regarding the information displayed on this website.